Cases, Accessories, Headphones for Samsung smartphones are always cool, the newly launched Galaxy S8 and S8+ is another great example of its predecessors except Note 7 disappointment. Today’s article will be leading you to the below cool invention and small gadgets or accessories of smartphones which will also support for Galaxy S8 and S8 Plus such as cover case. Samsung smartphones are already using some of the cool gadgets, Samsung Galaxy S8 and S8 Plus owners are seeking gadgets attachments on their phone and we listed amazingly best and cool 22 Accessories. The list will be mentioned as Camera, Phone Case, Holder, Wireless Charger, Charger Cable, cases and covers, Back Flip Cover and More..
cases and covers: OtterBox presents an outstanding protective cases and covers for Galaxy S8 and S8 plus, the cases will be available in 4 different color: Black, Aqua Mint Way (Aqua Mint/Mountain Range Green), Bespoke Way (Blazer Blue/Stormy Seas Blue), and on Plum Way (Plum Haze/Night Purple). The Slim design helps to prevent from getting slips. 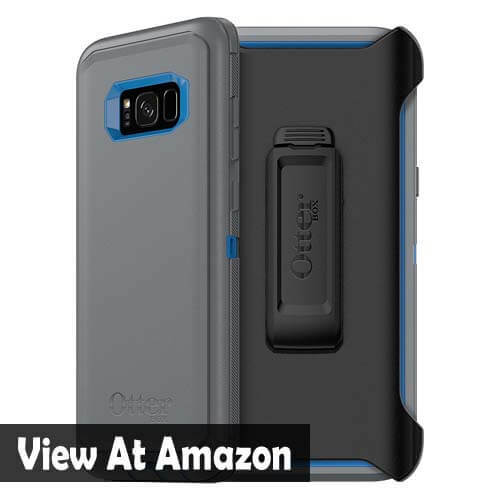 cases and covers: Another Case from OtterBox but this one has gripping difference from the above one! It is slimmer and sleeker, as per the phone is curvy the cover as well seems to be less edge support but still covers the phone from getting any damage. The stylish Galaxy S8 cover will be in Multi-Layer defence with again four different color. 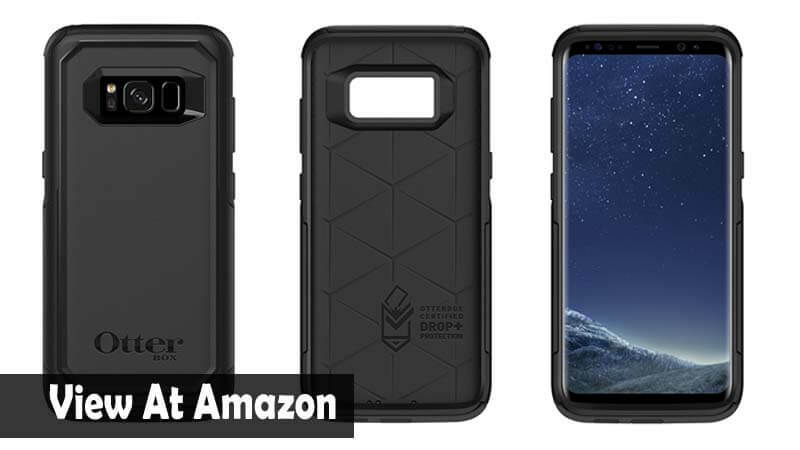 cases and covers: Another Best Case, cover for Galaxy S8 with amazing test, it has been tested from 10-foot high just to provide the protection to the owners of S8 and S8 Plus. The case made up of some ingredients that makes the case dynamic to absorb the shock as inside it has IMPACTIUM barrier for perimeter compression. The plain and slim back cover is lightweight and best Case for S8 and S8 Plus. 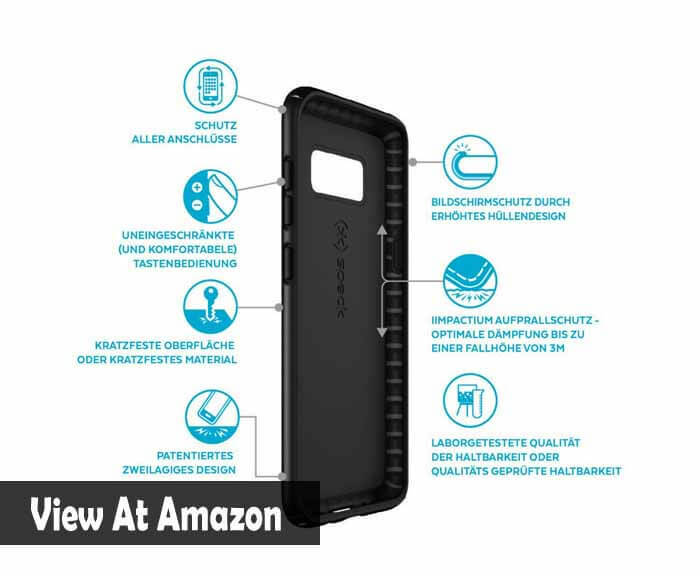 cases and covers: The another Galaxy S8 Plus Case from Speck in Five different design, you can see them below, the new GRIP technology offers ultimate protections, It’s been 10-foot drop test, No slip grip, the same technology material but on different design and compact as above. 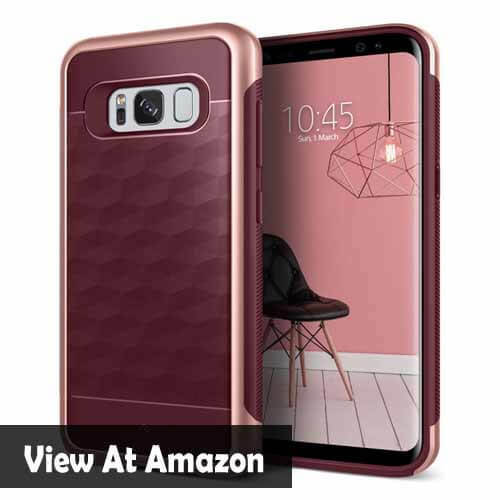 cases and covers: Another quite perfect color for girls, the case will be best in the hand of girls holding Galaxy S8, the caseology Geometric Slim Fit Dual Drop Protection with anti-slip Grip technology. The cover is scratch resistant with shock absorption TPU resistant, and it is only for Galaxy S8. 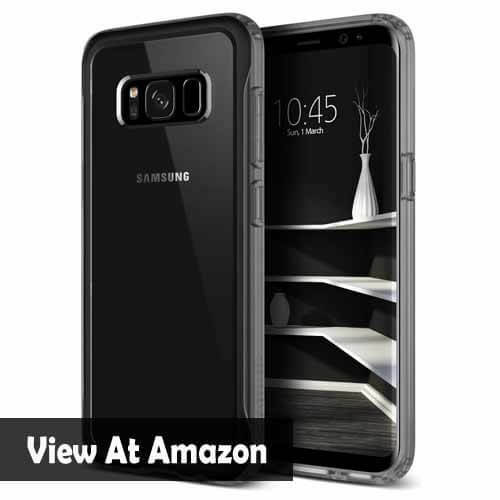 cases and covers: Crystal Clarity single piece case with clear black back cover panel just for Galaxy S8 Plus, Scratch free with anti-stain cover with drop protection material, the case eventually similar to the rest of Caseology cases but this one is slim with plain design which is best for normal view if any owner want. 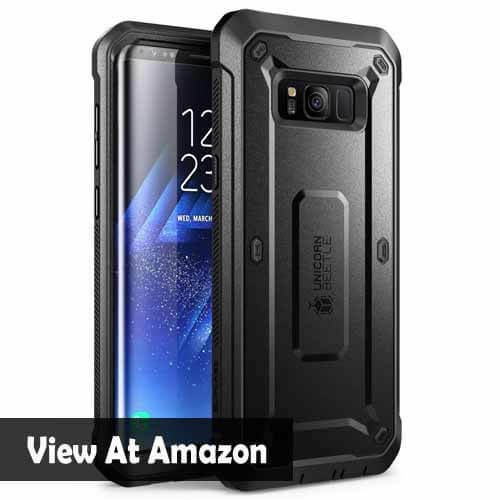 cases and covers: The new cover for Galaxy S8 is having some great features and functions, the three piece of the case can be detached, the front cover, back cover and holster, as the case is made of polycarbonate with anti-grip edges, the cover doesn’t cover all the functioning edges and screen. 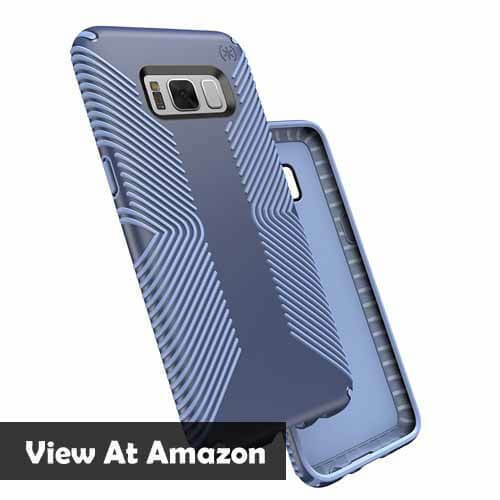 cases and covers: All design is same as Galaxy S8, this new case and back cover is fully similar to the S8 but has inch large. The same protection but in four different color, grab the favourite one. The case Holster belt clip rotates full 360 degrees. The Galaxy S8 curved Screen Glass is here, owners can get variety of tempered front protection glass from Tech Armor, the designed is only for Galaxy S8 with Full edge to edge 3D curved clear coverage glass. 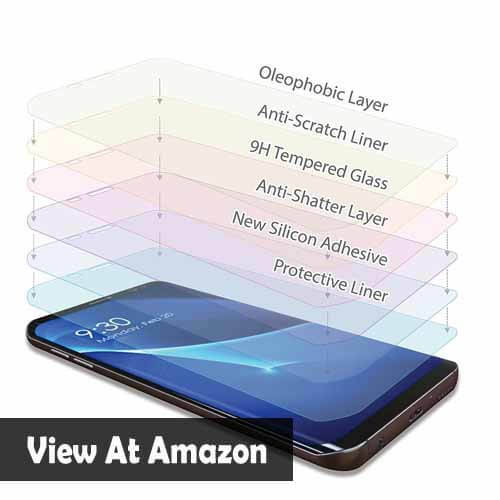 The glass is highly advanced in technology with screen guard. 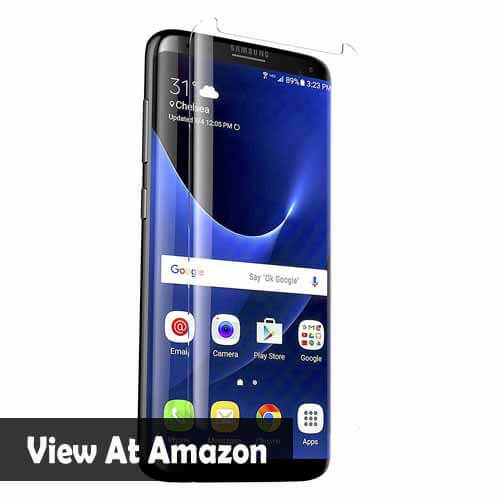 Another screen protector from ZAGG InvisibleShield in Curved GlassPlus screen, The glass is curved with all edges fits perfectly, The Glass is any case friendly to Galaxy S8, the smooth tempered glass is bendable to curved, the glass is scratch protection, no impact on image quality. Another yet great accessories for Galaxy S8 and S8 Plus owners, the USB type-C cable usually popular for high speed file transfer between one device to another, even it can be used for charging as well hence owners can also use Wireless Charger. 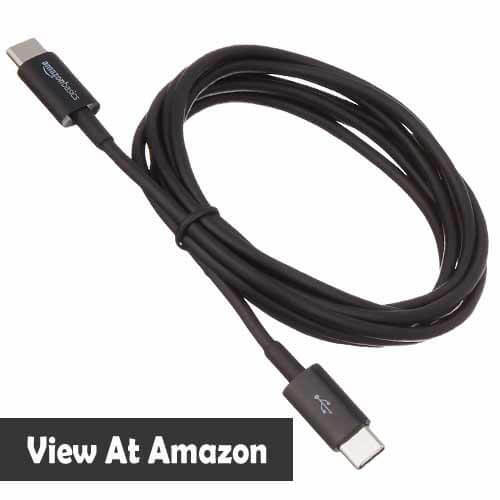 Connect USB Type-C with MacBook, Windows PC, Chromebook, or with your other Galaxy phone. It helps transferring files in high speed upto 480 Mbps with a output of 5V, 3Amp. 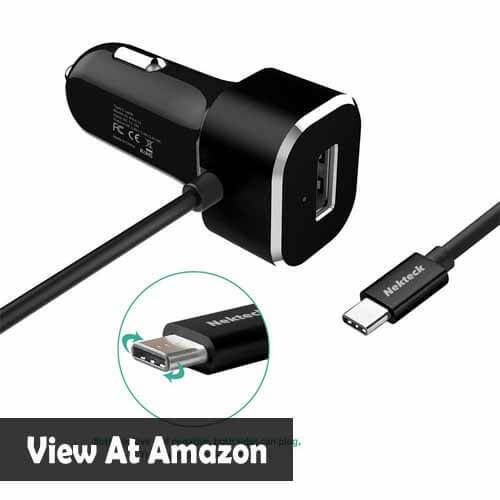 USB Type C car charger for Galaxy S8 and S8 Plus users, Easy to use charging adapter helps your phone to access cool cable and device features without getting tangled, full speed charging with 4.4A dual ports shared, Each port has IC intelligent identifies technology to maximize device charging speed. Yet another great accessories for Galaxy S8 and S8 Plus smartphone, the charger has triple protection from over current, overheating and short-circuiting. For fast charging it uses DC5V/2.4A and DC5V/3A or 27W, Auto LED indicator when the charge completes. 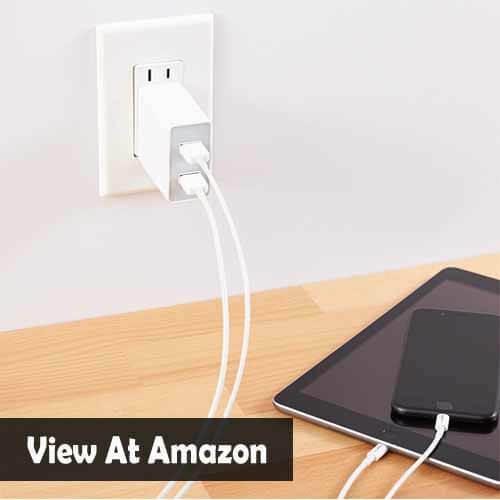 List of Galaxy S8 accessories doesn’t end here, the most popular Wall Charger is here, it has 24W capacity and electricity supplies which can charge two device simultaneously or at the same time, Other smartphones are also compatible with the charger which allow 24W electric supplies, Switch for ultimate protection on Internal safety, Auto shutdown and energy efficient. 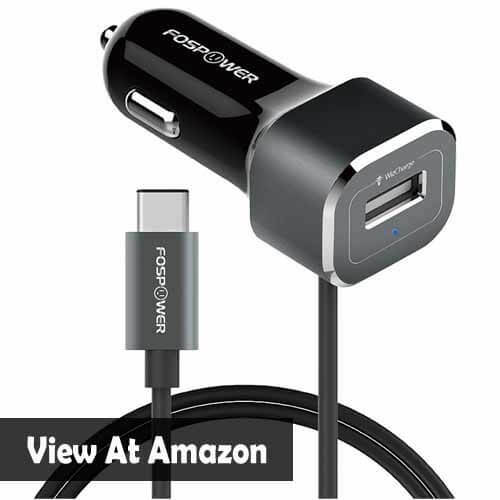 The Charger is great for every users right now holding a great high-end smartphone or Tablets. The new convertible Wireless charger for Galaxy S8 and S8 Plus is way more attractive when you can convert the way of charging from Pad to Stand, Using Stand charging will enables you to read notifications and upcoming calls without touching the device, on Pad charging mode you need to hold stand to view notifications and all activity, upto 9 watt wireless Fast Charging on select smartphone for 1.4x faster charging speeds, Inbuilt cooling fan during fast charging. 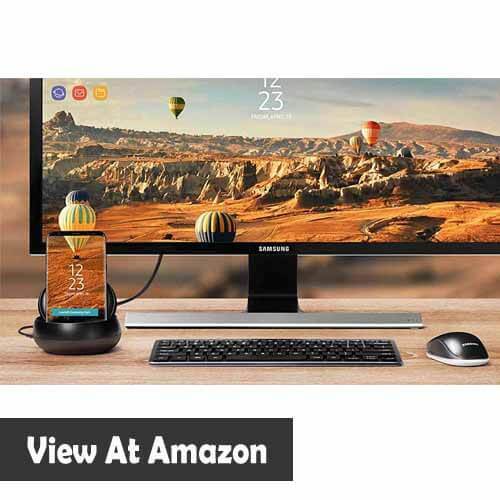 The One – Amazing – Innovation – From – Samsung, SAMSUNG DeX! 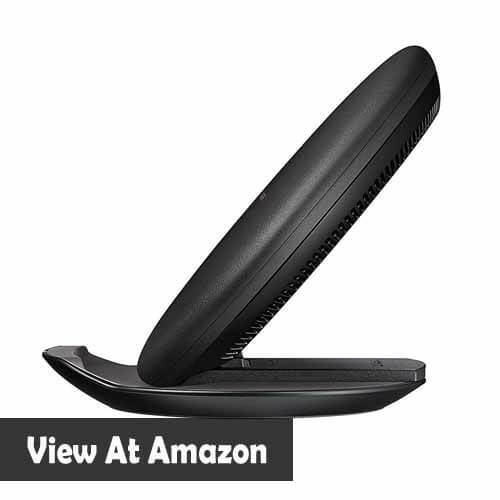 Yes this is an amazing cool device or you may call it gadget in gadgetsay, This gadget is only meant to make you experience of portable in pocket computer, Just connect your Galaxy S8/S8+ with Samsung DeX and then connect your Samsung DeX to your monitor, keyboard or mouse, then Bam, you are good to go, a fully optimised with amazing desktop UI is here. 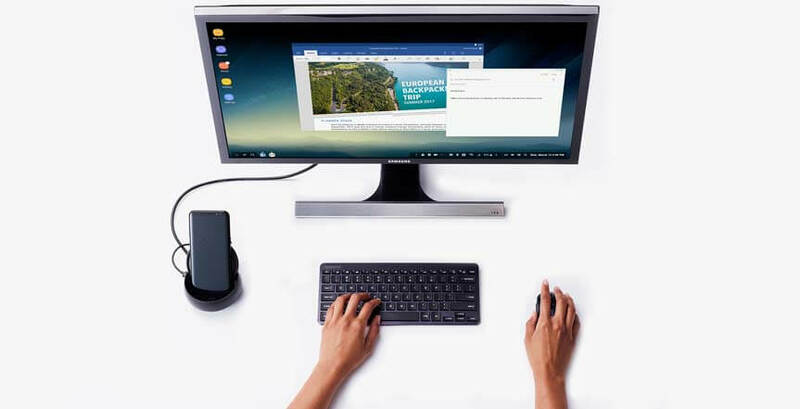 What can you do With Samsung DeX? 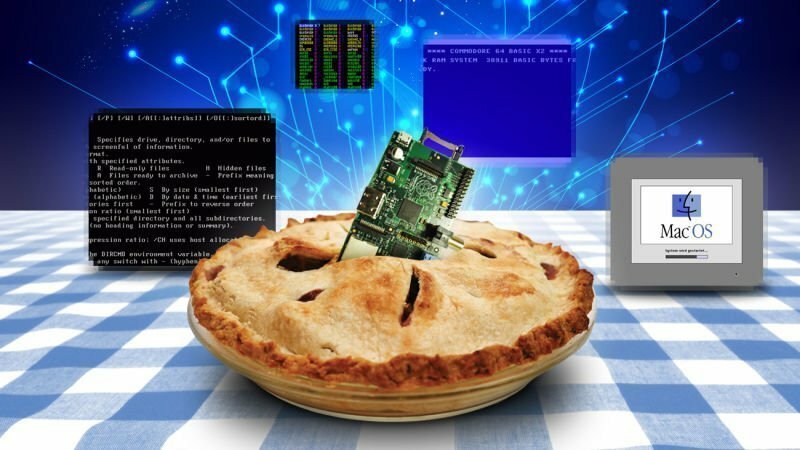 You can edit documents in big screen, watch movies, office work, and more as the regular computer can do, there are certain exceptions such as if you want to play high-end games then you need your personal desktop computer! 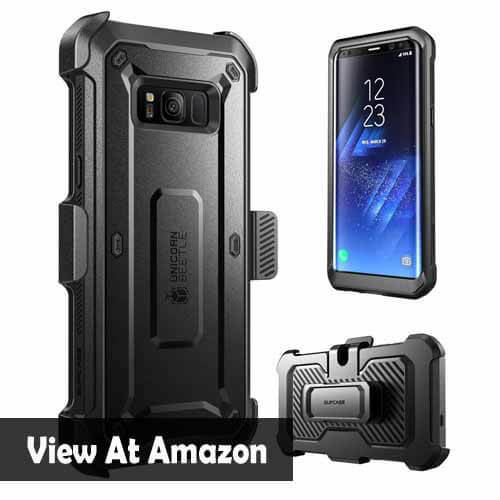 Other accessories for Galaxy S8/S8+? 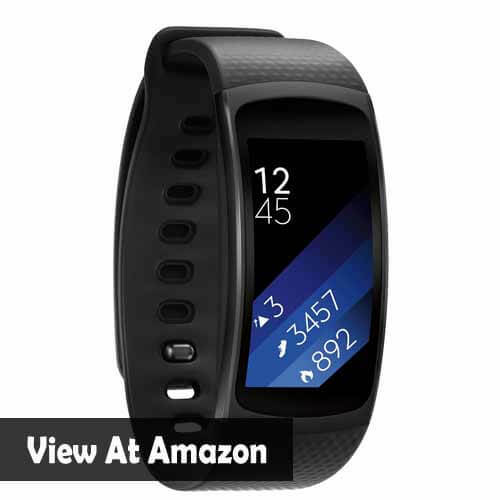 The Gear Fit2, The old but yet popular among Samsung S6, S7 and now will be with S8, The smartwatch is globally popular for its some interesting features such as Tracking steps, burned calories, heart rate and sleeping qualities, it has inbuilt GPS to navigate locations, regular features such as notifications, calls, text and on the go music. The device is quite popular in US, UK and Germany. 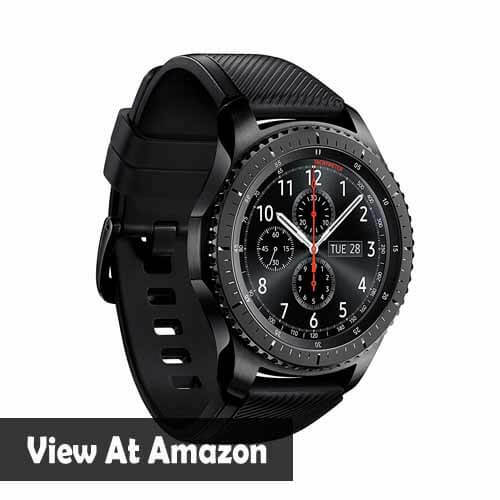 Smartwatch For Galaxy S8/S8+ is here, Samsung Gear S3 Frontier an interactive smartwatch compatible with Galaxy S8 devices. The Gear S3 cased with steel bezel that can rotate to access apps and notifications. It can be used for text, calling, notifications, navigation. The Gear S3 one of the popular accessories for Galaxy S8 right now, as from the launch of smartphone the demand on Gear S3 Frontier and Classic has increased. Users can use this smartwatch for payments also, using Samsung Pay. Rest safety features such as internal security and smartwatch resistance including dust, water and drop. 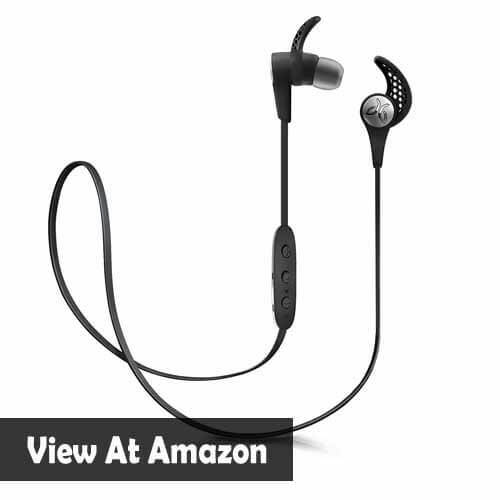 Another great accessory for Samsung Galaxy S8 or S8+ users, The Jaybird Bluetooth Wireless Headset. The headphone is focused on sound, Sweat-proof, less space, Universal ear fit, Longlife battery life and performance.operation from S8. You can get the headphone at different price and different color. Samsung always try to fulfill their users demand and their high profile lifestyle and for that Samsung launched another best accessories for Galaxy S8/S8+ smartphone which is Samsung Level U Pro, The Wireless In-ear Headphones with Noice Cancelling, Microphone and UHQ Audio, the device is available in two specific color, White and Black. The stylish Design is way more attractive from the above listed. and the price also low, also this headphone is from Samsung branded. So make your choice which one will be better for you. the continuous play upto 6 hours and sweat resistant. 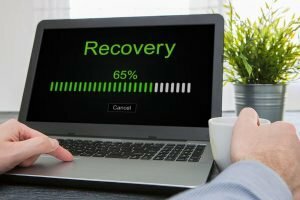 Samsung made it clear that they will innovate technology for their each smartphones they are launching, the Galaxy S8/S8+ supports many features as Note 7 was supporting but as per the injustice with Note 7 the Galaxy S8 will provide all the same and unique features. Now on the Cable free Samsung Gear IconX, The earbud specially made for highly comfort feeling, Stabilizing ear gels to keep the headset where it belongs and a charging carrying case for storage and charging when not in use. 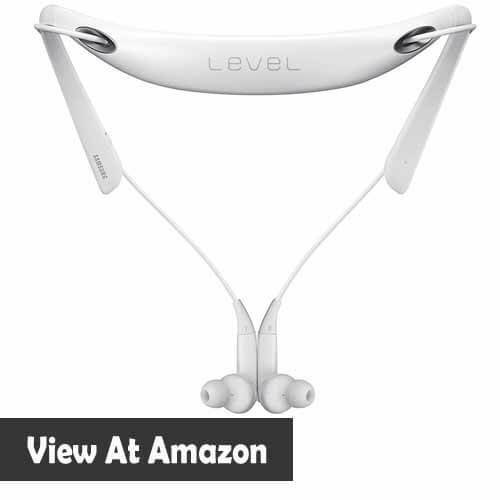 Built-in 4GB storage for music player, and other features such as Fitness tracking, Hear rate monitoring that allows you to share data with your smartphone. Other common features as Sweat resistant with coating for splash. Another best accessories for your Galaxy S8/S8+ smartphone will be the Tile Mate, one of the popular gadget that is so cool whenever you lose your important keys, The is the Keyfinder or anything finder because it has technology inside the Tile which helps the smartphone with an app to locate the Tile within your coverage area. 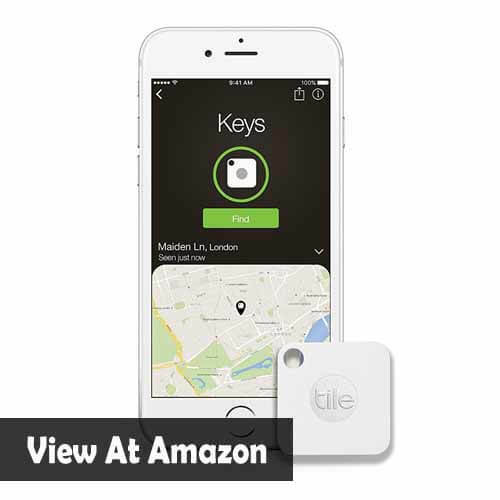 The device uses bluetooth tracker which can find anything, you can put the Tile into your another phone back pocket case, you can put the Tile to anywhere and then find again with the help of an application.